Kraft Foods' Claussen Pickles has recruited a live, supermarket-shopping penguin for its latest humorous effort to convey that pickle-lovers need to venture to the refrigerated section to find the brand, because "fresher (chilled) pickles taste better." 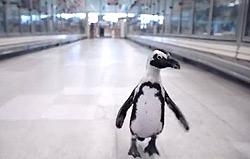 The 30-second video, from Chicago-based agency The Escape Pod, tracks a determined penguin's adventures as it wanders the aisles in search of Claussen -- including an unnerving encounter with an employee bearing a tray of freshly roasted whole chickens. Message: "Claussen: Migrate to the Fridge." Posted on Aug. 2, the video has drawn more than 512,000 views on YouTube to date. The digital campaign includes mobile distributed video, mobile banners and micro banners. Claussen is featuring the new video on its Facebook account (currently showing 119,000 "likes"), and driving engagement by asking fans to help the brand decide between two possible names for the penguin: "Steven Spears or "Cukes McGee." "Migrate to the Fridge" builds off of Claussen’s successful “Journey to the Claussen Pickles” campaign, which launched in 2011. That campaign's main video, featuring an intrepid British explorer using a dog sled to drive a puzzled-but-game supermarket shopper to Claussen's refrigerated section, has pulled nearly 1.16 million views.